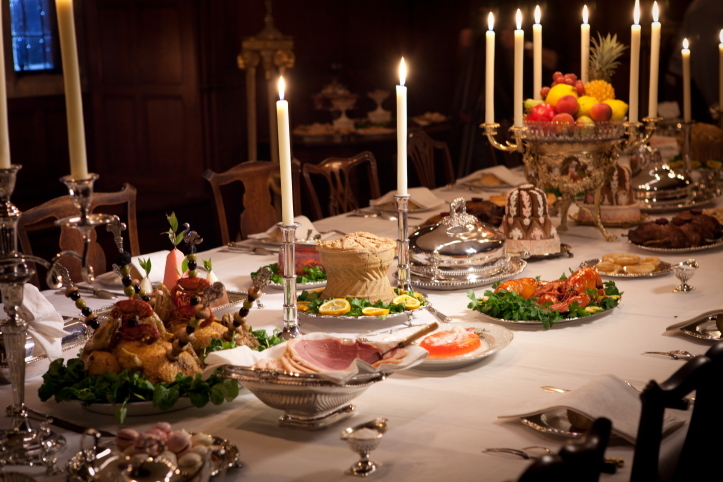 Those of you who regularly read this blog will know that I am frequently rather harsh about the lack of accuracy in food and table settings in period movies and television dramas. Rarely have I seen any recreations of this kind that have really impressed me. Though of course I constantly have to remind myself that these productions are not pretending to be anything more than dramatised settings of fiction, so the food and table setup are props for the cast to perform around. Therefore I suppose it is a bit sad of me to look for detailed historical accuracy in a fictional context where it is unlikely to be found. However, when the format of the production is a documentary, a medium which attempts a true reflection of reality, it is a different matter. On British television in recent years, there have been a number of documentaries which have attempted to examine the history of our food. In most cases these recreations have been worse than those of the period dramas. I am not going to give any examples, but some of these productions have really been wasted opportunities and I have frequently been embarrassed by my own involvement in them when I see the final edit. I believe that a more intelligent approach to food in history has the potential for really exciting - and yes, even more entertaining television than risk-averse commissioning editors realise. So how you might ask, can this sort of thing be done in a more revelatory and accurate way? Well the first essential factor is to work with a production team who really listen and understand these issues. When I was first invited to create the food and table for BBC2's documentary Pride and Prejudice Having a Ball, I had an exploratory meeting with the producer/director Ian Denyer. For the first time in my long career, I found myself talking to a television professional who was singing from the same hymn sheet as myself. Ian and his colleague Sarah Durdin Robertson were really keen to portray the same level of historical accuracy in their production that I aim for in my museum exhibitions. They too wanted to avoid the tabloid 'Carry on Banqueting' approach that has too often been the standard fare when it comes to the treatment of food history on British television. Silver specialist Christopher Hartop and his wife Juliet with a practice layout of the Regency silver at three o clock in the afternoon on the filming day. Ten hours later, they were still up, washing all this incredible stuff in the kitchen sink until 4.00am in the morning! 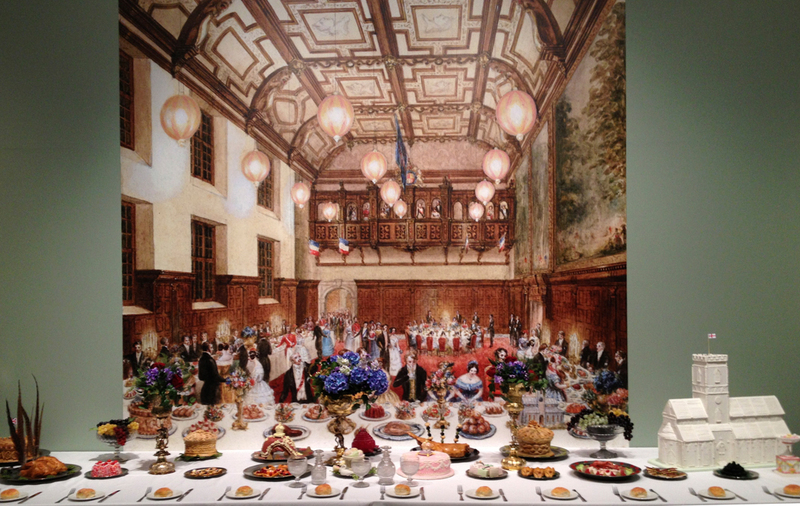 Christopher and Juliet organise decorative arts special events, including one called The Art of Dining. Find out more at Christopher's website. The second essential factor is to set the table with authentic equipage rather than the generic art department 'props' that appear in just about every production, even the big budget Hollywood ones. To make this possible I called upon the good offices of my friend and colleague Christopher Hartop, one of the world's leading scholars of historic silverware. Christopher miraculously sourced a large assemblage of authentic Regency tableware, making this production the very first to recreate a period table on British television with a high degree of veracity. The only disappointment was that the food could not be prepared in a period kitchen, though I made up for this in using a range of original equipment, especially in the preparation of some of the sweet dishes. 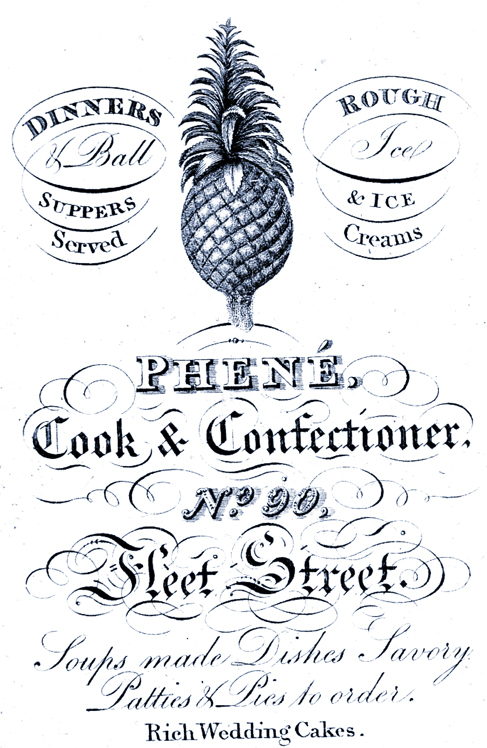 Confections from the Netherfield dessert you will have missed if you blinked when watching the programme! All designed for consuming with sweet wines. 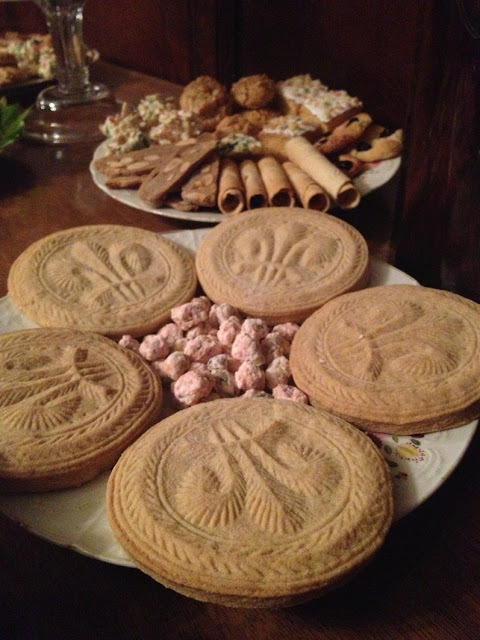 The Prince of Wales biscuits in the foreground, emblazoned with the iconic feathers emblem of the Regent, were made from Joseph Bell's 1817 recipe. The pink sweets are Pistachio Prawlongs from Frederick Nutt's 1789 The Complete Confectioner, a key work of this period. The plate in the background contains spice biscuits, wafers, sweetmeat biscuits, toad in a hole biscuits, millefruit biscuits and filbert biscuits, all also made from Nutt's recipes. Nowadays, we dunk biscuits into tea, but at this period they were used for dipping into the unctuously sweet wines of the dessert course. 'At half-past three o’clock the company sat down to a sumptuous banquet, the viands and wines being of the first description, with a desert of ices, strawberries, cherries, and grapes by Mr Gunter. Music was provided by Mr Gow’s Band'. 'At 2 am the company then adjourned to the supper-tables. Here a most sumptuous display indeed was made, there were no less than six supper-rooms, all fitted-up in the most beautiful and appropriate manner. 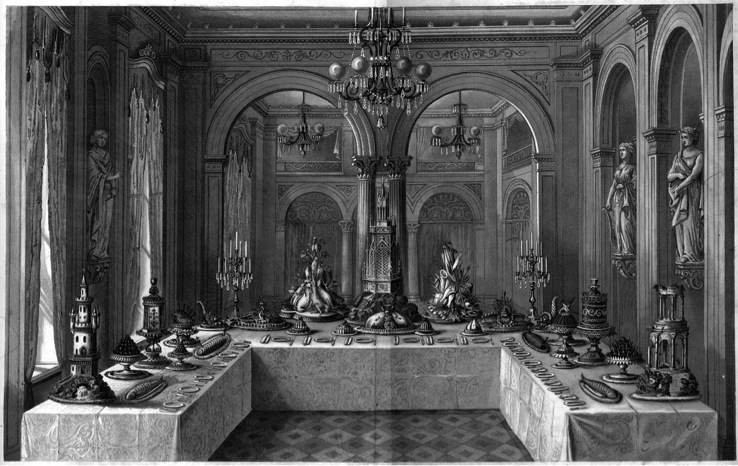 Each table was brilliantly ornamented with trophies of war and peace; emblems emblematic of the arts and sciences: the costume of all civilized nations of the earth, exemplified in waxen images, modelled for this fete expressly…the plate, and the china, displayed and the brilliancy of the lighting-up of the tables, the effect was grand in the extreme. To render the coup l’oeil complete, about two hundred beautiful women (for the major part of the females were really beautiful) sat in such prominent situations as to be seen in every part without the least difficulty. The supper, we need not add, was most excellent; the wines abundant, and all of the rarest kinds. The dessert fruits, and confectionary, were equally deserving of panegyric: the Duke of Clarence spoke in raptures of them'. 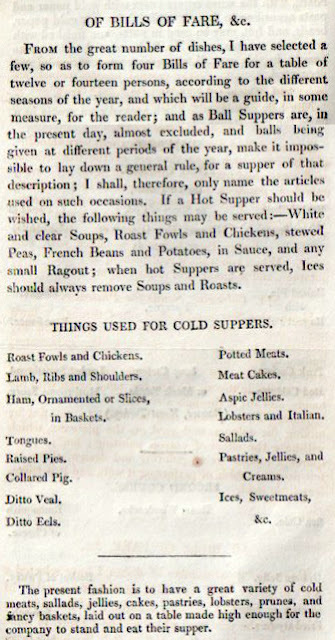 This brief page on ball suppers from John Conrade Cooke's Cookery and Confectionery, (London: 1824) tells us that by this time it had become fashionable to eat the food provided at balls standing up. Austen tells us that the Netherfield supper was a sit down affair. Of course, the style of dining she had in mind was that of the late 1790s when she wrote the book, not the Regency period when it was published. 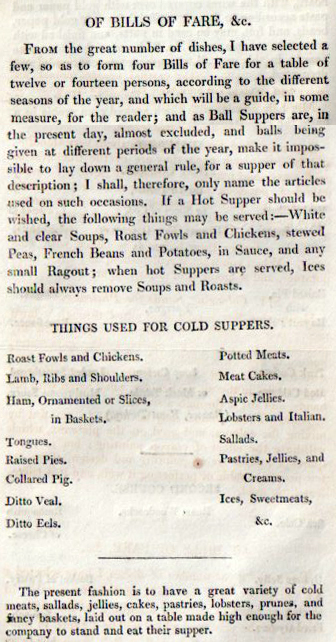 I would have preferred to have produced a 1798 supper, but the BBC wanted to set it in 1813. Note that Cooke mentions 'White Soups'. He also tells us that the hams were ornamented or served in slices. Stand-up ball suppers became the norm in the Victorian period. This is a museum display I undertook last year of a stand-up ball supper based on an actual event at Hatfield House in 1845. It was part of the 2012 Bowes Museum exhibition Feast your Eyes. 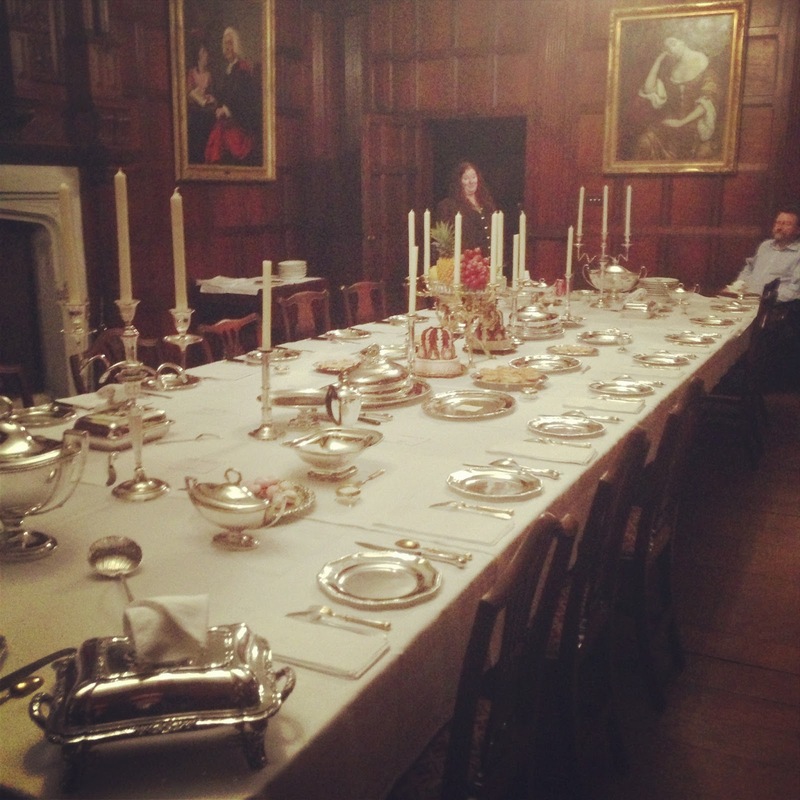 Amazingly, when my team did finally recreate the supper for filming at Chawton House in January, because the schedule was running very late, the food was not delivered to the table until 2 am. And we finished the washing up at 4.00 am. That day we started work in the kitchen at 7.00 am, making it a massive twenty-three hour shift! This sort of schedule was probably exactly the long kind of day that the servants who prepared and served at these affairs would have experienced in the Regency period. Creating a meal on this scale would have been the job of a large team of professionals over a number of days. Confectionery keeps well, so it was made well in advance. A lot of the cold dishes and pies were usually made the day before. This was the pattern we followed. My team was truly remarkable, working under extremely difficult conditions and for very long hours. Lesley Sendall, food stylist extraordinaire, was my second in command. In the kitchen, the meat and fish cookery was carried out faultlessly by the highly talented chefs Sylvain Jamois and Chris Gates, assisted by the always calm Emily Hallett and Roy May. I wish that I could have worked with them in a real period kitchen, like my own in Cumbria, teaching them how to roast in front of a fire and prepare their sauces on a stewing stove. In the dining room, Christopher Hartop and his wife Juliet laid out the remarkable silver and trained the waiters. Christopher, a former Executive Vice-Chairnan of Christie's is the author of numerous books and papers on silver. We all learnt a great deal about the logistics of such an ambitious entertainment, including the long hours of washing up afterwards in the small hours. Though unlike the scullery staff of 1813, we had good washing up liquid rather than hard soap and plenty of hot water - though that failed at one point! In the description above of Mrs Beaumont's ball, it is mentioned that the tables were decorated with emblematic wax ornaments. 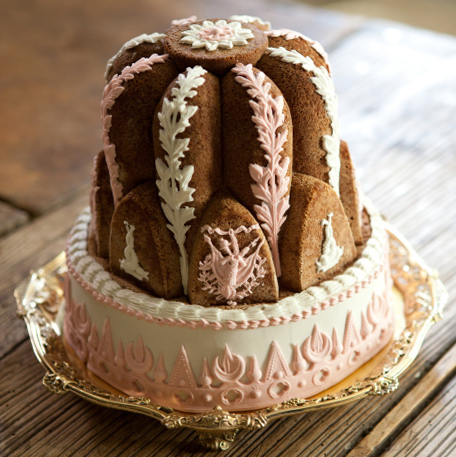 These pieces montées, or 'dressed plates' were also made out of sugar and edible materials. They were designed and made by very skilful confectioners who specialised in such work, and could even be hired just for the evening. 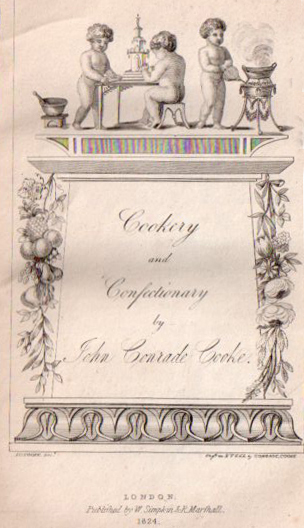 One little known, but important book by the cook and confectioner John Conrade Cooke - Cookery and Confectionery (London: 1824) illustrates some of these extraordinary objects. The example I reproduce below was a sort of culinary 'mobile' that trembled elegantly when the guests sat at the table. It was appropriately called a 'tremblent'. These stunning wobbly centrepieces were popular all over Europe until the middle of the nineteenth century. They would have picked up and amplified every movement from the dance floor. 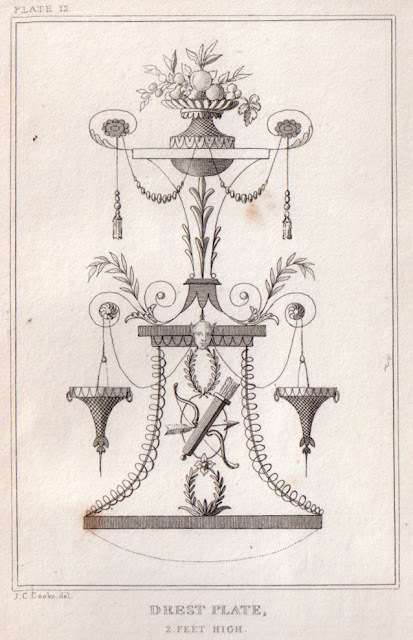 A 'drest plate' or tremblent by John Conrade Cooke. 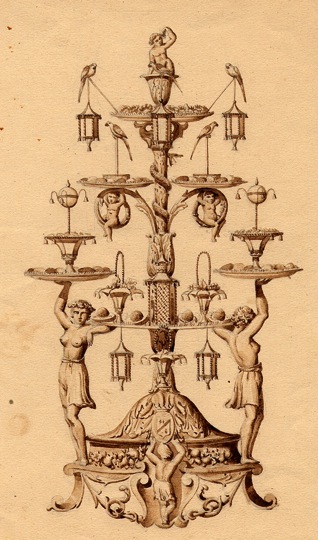 Although there was neither time, nor the budget to make table ornaments like this for the programme, I did make two of Cooke's ices for our reconstruction of the Netherfield ball supper - tamarind ice cream and negus ice, both served during the dessert in contemporary ice coolers, or seaux à glace. A remarkable design for a tremblent by the Turin confectioner Prati to be entirely executed in sugar paste c.1825. 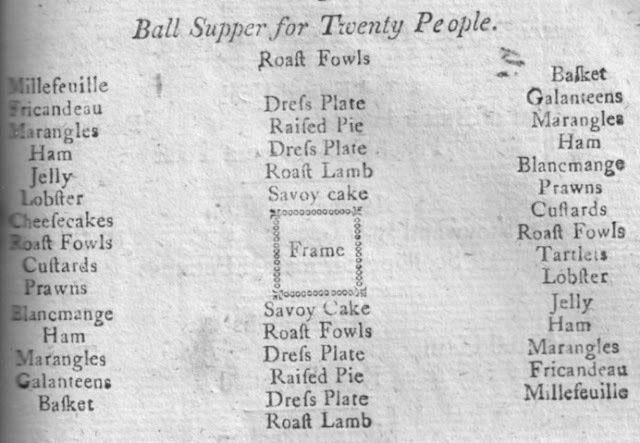 Bills of fare for ball suppers are actually few and far between in the cookery literature of the period. One of the best examples and the one we decided to use as the starting point for our supper was published in later editions of William Henderson's The Housekeeper's Instructor. It first appeared in the 1805 edition, a version of the book much 'corrected, revised and augmented' by Jacob Schnebbelie, principal cook at that iconic residence for high status bachelors - Albany in Piccadilly. 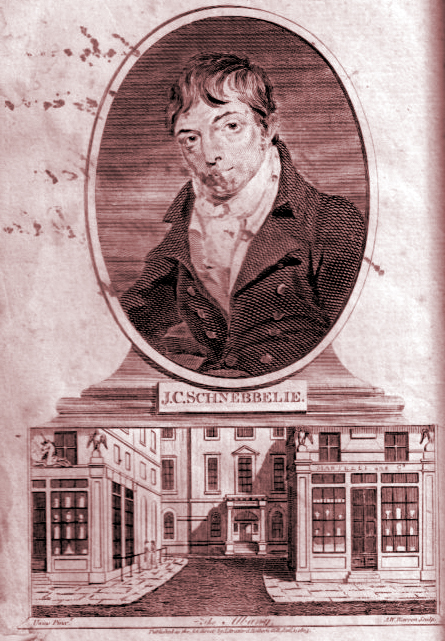 Portrait of Schnebbelie with the Albany from William Henderson, The Housekeeper's Instructor (Twelfth Edition, London: 1803). It is likely that Schnebbelie fed such regency worthies as Henry Holland, Lord Byron and Robert Smirke, who all lived in chambers or 'sets' in the Albany on his watch. Schnebbelie's scheme includes four dress plates down the middle of the table with a small dessert frame in the centre. These raised frames, also called plateaux or surtout were very popular for raising dramatic ornamental centrepieces above the level of the table. With four dress plates and a frame, this layout is for a very ambitious entertainment indeed - to my mind, in style and scope somewhat more Mr Darcy or Lady Catherine de Bourgh, than Mr Bingley. On either side of the frame is a Savoy cake. These large moulded sponge cakes were decorated with gum paste ornaments and made conspicuous ornaments for the table in their own right. I decided to drop the dress plates. but retain the savoy cakes. 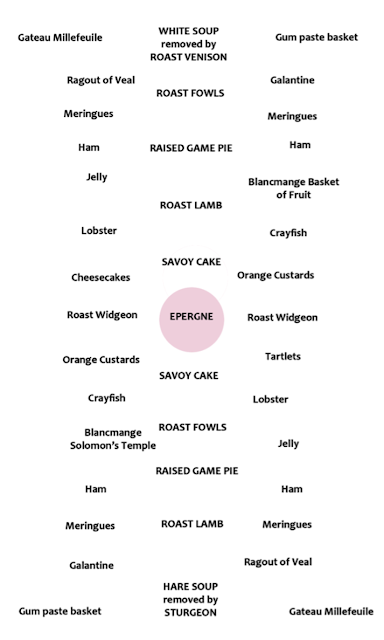 Schnebbelie's ball supper scheme, with its 'frame' and 'dress plates' is for a very grand ball supper. He also included a plan for the dessert which followed. From William Henderson, The Housekeeper's Instructor (Twelfth Edition, London: 1803). This large gum paste triumphal arch with its trophies stands on a dessert frame or plateau. 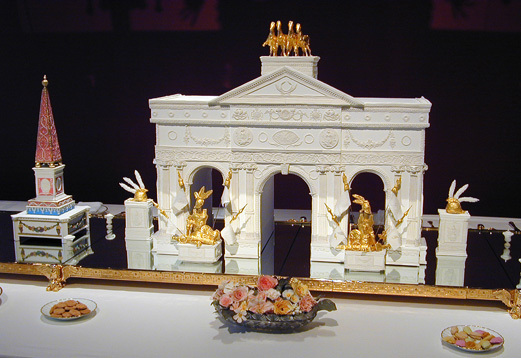 I made it for the exhibition Royal Sugar Sculpture in 2003. It is now displayed in the table decker's room at Brighton Pavilion. In this decorative title page to Cooke's book, the two little fellows at the table are preparing a 'drest plate'. The items on this 1870s French ball supper buffet include pieces montées and trophies of game and fish. 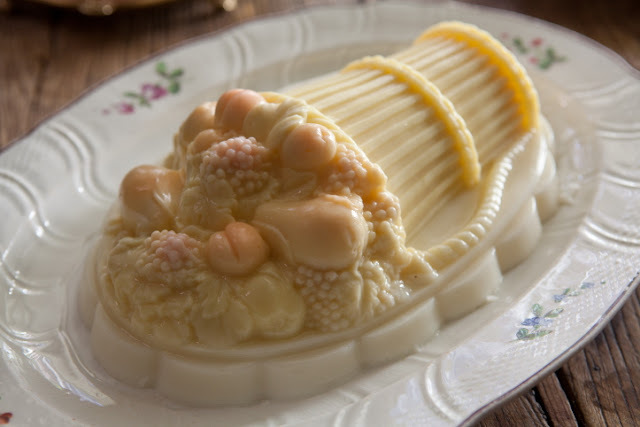 A Regency period mould in my collection, which I used to ornament the Savoy cake above. Ball suppers were prepared and served by professional caterers with advanced skills in both cookery and confectionery. Schnebbelie includes two blancmanges in his scheme, which were likely to have been made in the intricate moulds of the period. The mould used to make this beautiful blancmange basket of fruit was made by Wedgewood in the 1790s. Photo by Sarah Durdin Robertson. 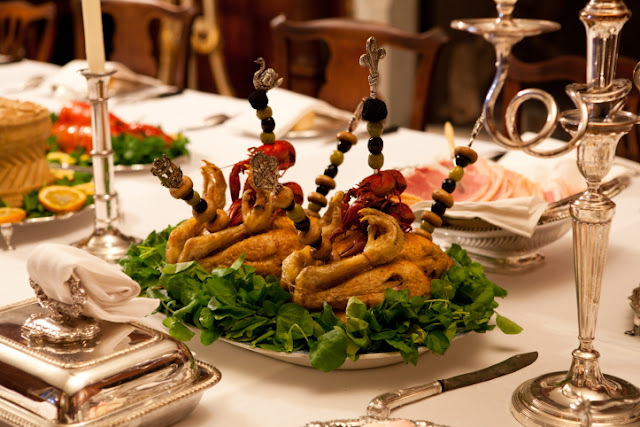 Schnebbelie's cold fowls were likely to have been ornamented with fashionable silver hatelet skewers garnished with such delicacies as whole truffles and crayfish. Note the slices of ham on the napkin in the silver basket, served as per the instructions of John Conrade Cooke reproduced earlier in this post. Photo by Andrew Hayes Watkins. © Optomen Television. Many of the savoury dishes in the meal were from Henderson's book, though some, such as the Austen favourites white soup and haricot of mutton were based on recipes in Martha Lloyd's and the Knight family manuscripts, housed at the Jane Austen House and Chawton. However, most of the recipes in these wonderful collections are of a domestic nature. Much grander dishes would have graced the table of the fashionable and aspirational Bingleys, especially at an entertainment at which they were attempting to impress grandees such as Darcy. 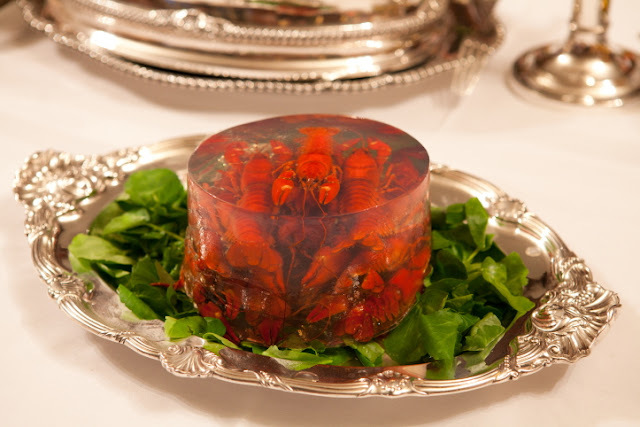 Crayfish in Jelly. Photo by Andrew Hayes Watkins. © Optomen Television. The recipe for the dish above. 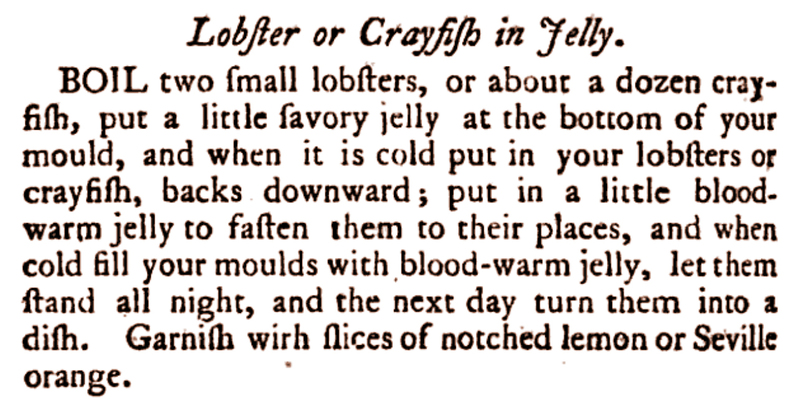 From Richard Briggs, The English Art of Cookery (London: 1788). 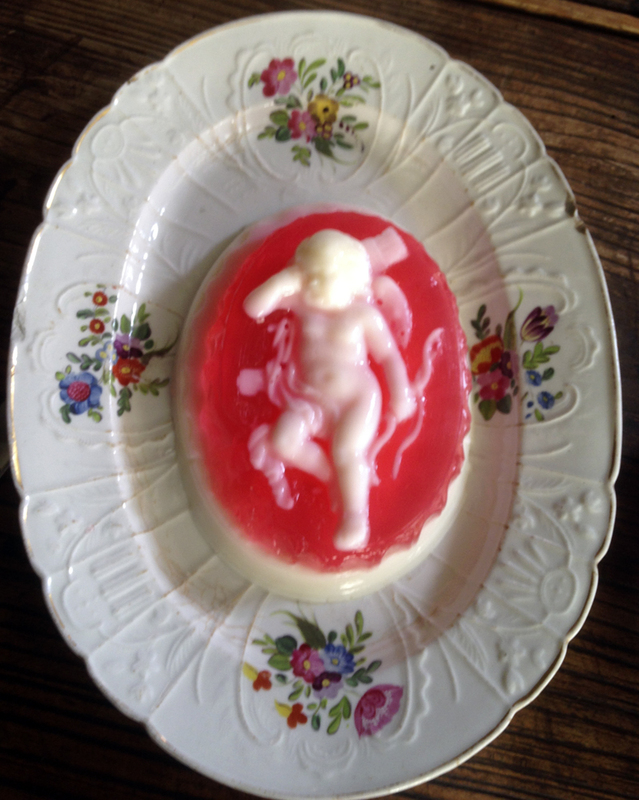 A sweet jelly this time, moulded in cameo style made using a 1790s Staffordshire mould. This is the final bill of fare for the supper. Its core is the 1805 arrangement designed by Schnebbelie reproduced above, but with the addition of two soups and a number of other dishes mentioned by Austen, such as haricot of mutton roast widgeon and ragout of veal. There was also a dessert course, which I will discuss in a later post. 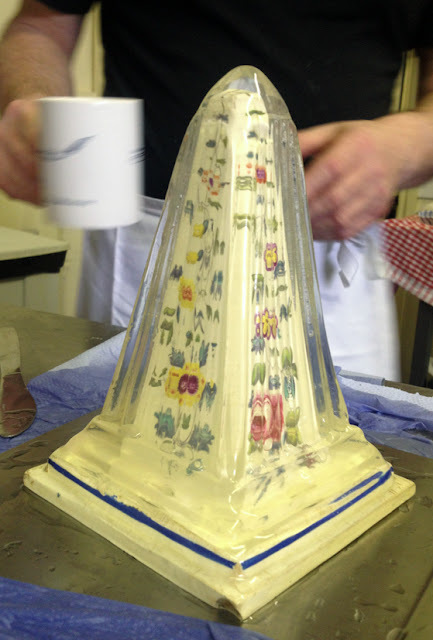 Ivan enjoys a cup of tea after the stress of unmoulding this 1790s Staffordshire core jelly obelisk. It was worth it as it did appear on the screen for a micro-second! A lot of you who have already watched the programme and have contacted me to say that you would have liked to have heard more about the food. 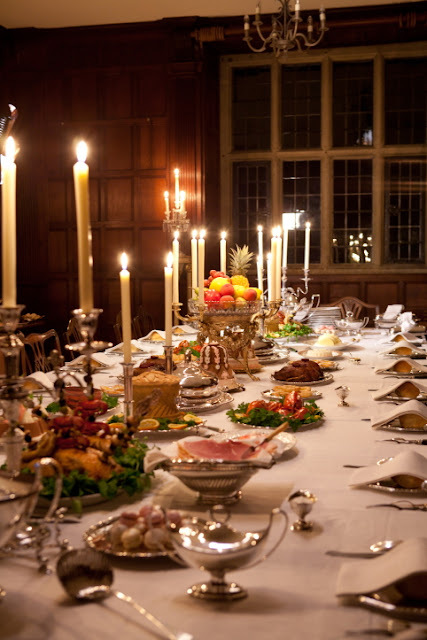 Well, the supper was just a part of the whole event and what had to be foremost in the narrative of the programme was how the context of the ball set the dynamics of Austen's plot. I thought the programme makers and presenters made a good job of this. 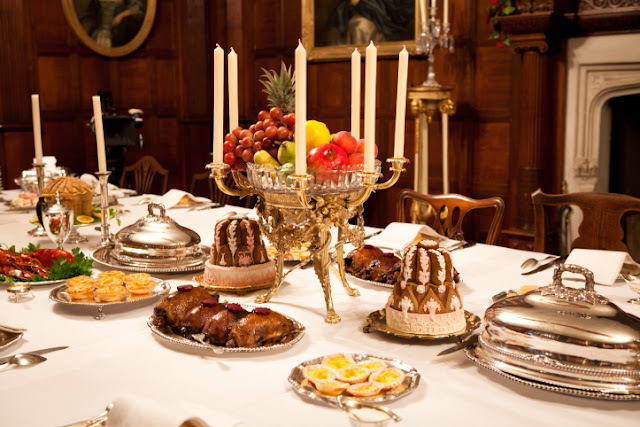 The extraordinary culture of Regency dining really needs a six part series of its own. Though I am afraid that commissioning editors think that modern audiences do not have an appetite for this sort of thing. They are entirely wrong of course! Some of the sharp-eyed among you noticed a few errors of fact in the voice-overs in food scenes. Alistair Sooke said that the parmesan ice cream was made from a recipe in Frederick Nutt's Imperial and Royal Cook, which of course does not contain any ice cream recipes. It was made from Nutt's earlier work, The Complete Confectioner of 1789. Well spotted! Three of you realised that the liquid unfortunately described by Amanda Vickery as a 'gallon of gravy', must have been the hare soup, because it was being poured into a particularly fine Regency soup tureen. It was! The other tureen was used for serving the famous white soup. And yes, the meat in a veal ragout was not 'slow roasted', nor shredded - it was stewed. I am never sure who writes the texts of voice-overs, but in my experience they are the area in these productions where the most errors creep in. It can be particularly annoying when an expert contributor has mentioned on camera the true facts and in the presenter's voice-over which replaces it, the truth gets mangled, or ends up substituted by some nonsense gleaned from Wikipedia. It happens to me all the time - but I guess that is one of the joys of show biz! Although my meal was set out correctly for this period, the mode with which it was consumed in the programme by the modern diners would have raised a few eyebrows in the early nineteenth century. Place a group of excited twenty-first century dancers round a lavish table at 2.00am in the morning and you will not get a perfect demonstration of Regency period manners. À la française dining was a socially dynamic mode of service, but not quite the free-for-all depicted here. If you live in Britain and you missed the programme first broadcast at 9.00pm on the 10th May on BBC2, you can catch up with it over the next week on BBC iPlayer. It is presented by Amanda Vickery and Alistair Sooke. It is an Optomen production for BBC2 commissioned by BBC2 Controller Janice Hadlow and Mark Bell, Commissioning Editor, Arts. The Australian science fiction convention Conflux has become known for its historical banquets, researched by historian Dr Gillian Pollack and tested by volunteers, before being handed to the hotel at which the convention is being held. Nothing quite as fancy as the one you did, but the food was as accurate as possible when you have to rely on a modern hotel kitchen. This year they held a Regency banquet, which I attended and enjoyed very much, with historical dance and music. Thanks Sue. There are also a handful of excellent scholar cooks in Britain, who are well able to produce accurate renditions of period food. A few also undertake it in real period kitchens, but my point is that you rarely see their work on British television, because the recreation of historical food and meals is more often carried out in the media by 'celebrity chefs' and food stylists, who rarely know what they are doing. But the other point is that the culture of dining is hardly ever shown correctly even in documentaries, because production art departments rarely have access to real period tableware. I produced the food and arranged the table for the movie for The Young Victoria, but the 'props' provided by the decorator were completely inappropriate, so the final result was not as revealing as table settings I have undertaken in museum exhibitions where I have had access to genuine decorative art objects. The food was only a small part of this excellent documentary, which examined the whole milieu of the early nineteenth century ball - the social conventions, the dress, the dances, the music etc. I have only posted stills of the supper and a few items of food. There were over sixty one dishes on the table over the two courses, which were all sampled by the dancers. They sat down to the table and dined for the first time in their lives in full à la française style. I hope you eventually get to see the programme on Australian television. Unbelievable. The blancmange was so beautiful; I would love a taste. I applaud your bringing authenticity to the table. To be able to pull tableware of this quality is truly astonishing. Although people think all film budgets are gigantic, on smaller films they are not and art departments must work miracles with very little. I am sorry the decorator on Young Victoria provided inaccurate materials –– that is bad form. However, many try to do their best and have done meticulous research only to have their budgets and lack of time restrain their desire to do things right (they often cringe that they couldn't do what they wanted, believe me). What you have done would be any designer's dream result. Your work is perfect. PS, Were the tables set counter-height for balls? I know you work in the film industry and I appreciate your kind words. The problem is that authentic tableware is rarely available outside closed museum and private collections. To furnish a Renaissance table in a movie for instance, with real Venetian glass and silver from the period would be very difficult, if not impossible. But it can be done for real in museum settings and that is what I have spent my career doing, though most curators would not allow an actor within a hundred miles of a genuine sixteenth century Venetian glass. It is of course easier to source late nineteenth century and twentieth century objects, but the earlier you go back, the more difficult it gets. I am not a decorator, but a curator, so it is easier for me to source objects for the table. I often film in period properties, which already have great stuff to work with in their collections and dining rooms. On the subject of budgets, film and even tv budgets are actually much higher than those in the museum world, where the really convincing and revelatory stuff on food and dining often gets done on a shoestring. As to the height of the tables for ball suppers. If you read the passage from John Conrade Cooke, it would seem that he is telling us to raise the height of the tables for the stand-up variety of supper. Like that in the painting at Hatfield House. But Mr. Day, YOU are a celebrity chef, and someone at BBC should take notice of that and give you your own show. I'm always thrilled when you appear in various productions and I have no idea why your talent has not been seized on and put to use in a six- (or more) part series. A show that I think would be fascinating would trace the development of customs over time--the table furnishings, plates, cutlery, and such; the servants and their work; the sequence of dishes; the table manners. The cooking of it all, and how that changed through the centuries, is equally fascinating. How could this not be as interesting and draw as great an audience as any number of disappointing shows I've seen? I made sounds of delight when I first watched the program and saw you in their kitchen, and am happy that you wrote about your perspective on the dining at the event. As I live in the states on the west coast, and being currently without the funds to come to your marvelous lectures, I enjoying soaking up the information that you give out on your blog and in programs such as this. I am currently trying to make my way through several period cook books and seeing the food prepared lifts my spirits and urges me to continue my study. I greatly enjoy this era and am part of a group of people who regularly comes together in costume. I look forward to the day that I will have not only the information, but also the serving dishes, to create a authentic Regency meal. If you do not mind, I have a foolish question. 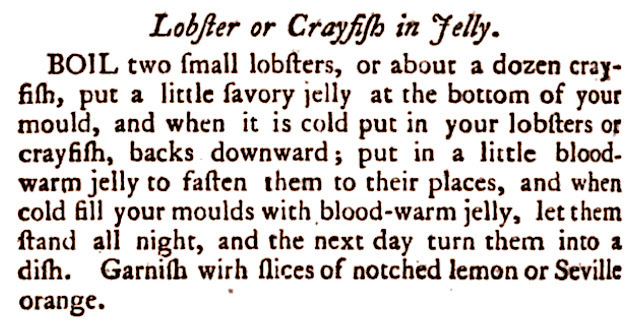 How do you eat the crayfish in jelly? It is a stunningly beautiful dish. It strikes me that it would be slippery, possibly difficult to get the crayfish (even just the tail) out of its shell, and nearly impossible to eat with, well, much of any elegance. Good evening. I saw this programme for the first time over the Christmas period and can't believe that I missed it first time around - fascinating insight...thank you. I have a question if I may - I noticed that when cutlery was laid out, the forks and spoons were placed upside down...can you tell me why they did this please? Thank you. Marc, There are a number of theories. One is that it is thought the tines of forks were turned downwards in case they caught in the elaborate cuffs of the diners. 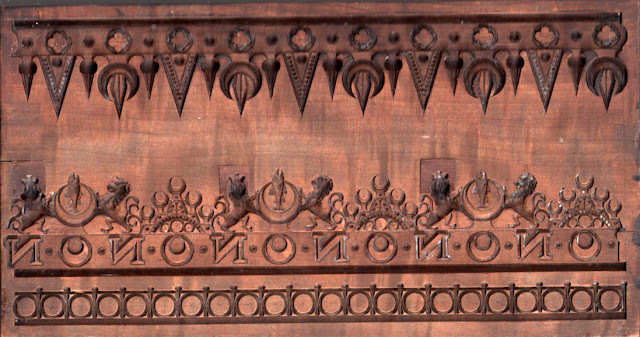 The second is more likely - what we would call the backs of spoons and forks were often engraved or chased with family heraldics. If they were arranged in the modern way, these would not have been visible. So I suppose that means that it is us who have our spoons and forks upside down, not our Georgian ancestors. Thank you! It has been difficult to find information about food and entertainment for this time period. I would love even more information! Especially regarding middle class food of this period.